When she was born in 1533, Elizabeth was a great disappointment to her father. King Henry VIII of England had hoped for a son and heir and was distraught and angry when Anne Boleyn gave birth to a little girl. Before long, the King ordered the mother’s execution. Elizabeth was cast away. But, as every student of history knows, that was not the end. Elizabeth would go on to be crowned Queen. What’s more, she’s widely-acknowledged as one of the greatest monarchs to ever sit on the English throne, ruling for an incredible 43 years. To her fans, Queen Elizabeth I was the finest of the Tudor monarchs. She was well-read and highly intelligent. Under her, a ‘Golden Age’ of English culture flourished, while she even managed to establish a ‘middle way’ between extreme Catholicism and extreme Protestantism, bringing to an end many years of sectarian discord. However, to her detractors, Elizabeth was not all she appears to be. For them, she has benefited from centuries of revisionism when, in reality, she allowed England to become almost ungovernable. Queen Elizabeth ruled England for 43 years, but she remains something of an enigma. Pinterest. One of the most bizarre – and most enduring – myths surrounding Queen Elizabeth is that she was actually a man. Some scholars attribute this to simple chauvinism – that is, over the centuries, some people have refused to believe a woman could rule in such a wise and dignified manner. Notably, however, even learned, intelligent people have believed in such a conspiracy theory. For instance, Bram Stoker, the author of Dracula, was one of many who believed that Elizabeth died at a young age and was secretly replaced by a young boy who grew up to sit on the throne. It is true that Elizabeth was sent away from London, to the small city of Bisley, at a young age. Her father, Henry VIII, wanted her to be safe from the plague that was sweeping through the cramped city. According to the legend, she still fell ill and died. 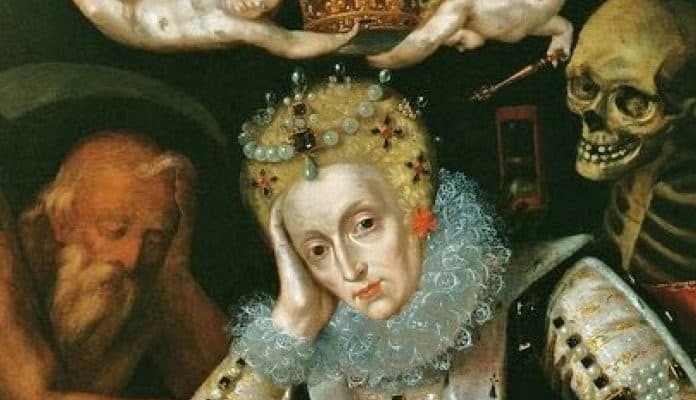 Distraught and worried that the King would have her executed, Elizabeth’s nurse found a young, girlish-looking boy, wrapped him in blankets and pretended that he was really the Princess. It’s also alleged this is the reason why Elizabeth remained unmarried – she couldn’t be intimate with anyone, lest her secret be revealed. However, all serious historians have dismissed the theory as pure fantasy – after all, it would have been almost impossible to keep such a secret, especially since the Queen had many enemies.